Depending on who you ask, straws are either having the worst year ever, or a revolutionary one. For whatever reason, be it Hashtag Activism, or their ticket just finally getting punched, in 2018, everyone’s starting to get hip, woke, whatever—they’re fully-realizing the danger of single-use plastics (like plastic straws). For example, the EU voted to completely ban single-use plastics. Seattle recently became the first major American city to ban plastic straws. And, bottom-lining it, whether you like it or not, the simple fact is this: On a long-enough timeline, there’s never a good argument in favor of plastic straws. Which is why everyone, all the cool kids, are getting themselves their own reusable straws. And not just any straw—a good one. Maybe one that, say, is easy to clean. Or one that you don’t have to schlep around all inconvenient-like. One that comes in a few decent colors would be nice, too? 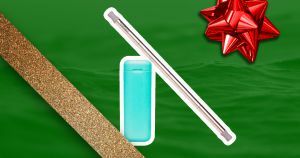 Alas, enter FinalStraw: The collapsable, cleanable, folding straw-on-a-keychain that took Kickstarter by storm, to the tune of a $1.8 million-dollar crowdfunding campaign. Why all the fuss over a folding straw? Well: It’s simple to clean. It works with all to-go cups. It comes with its own case. It should last you, according to FinalStraw, about 3600 hundred cycles (or five years at twice-a-day use). It’s latex-free and BPA-free. It’s dishwasher safe. And the case comes in five colors. But if none of those selling points are enough, how about this one: You’ll be saving the world, one sip at a time. Also, it’s a brilliantly easy, cheap stocking stuffer for anyone you know. Especially anyone intent on ruining the world with their plastic trash, or trash habits. Or people who can’t drink out of the lid of a cup correctly. Or anyone who you just want to smash, with a present, into a moral equivalence quagmire, where they will be forced to reckon with their own innate selfishness and the fact that they do not, in fact, want a better world for those who come after them, and that they are—let’s be perfectly clear—destined to repeat the cycles of damage, not just to our Earth, but the people on it. Because they just need to drink out of a plastic straw. That, you will argue with this person, is the reason they want their children to have a dying world. This is a perfect gift for them. And it only costs $25! Buy it here at FinalStraw.